The post-mortem examination of the unidentified person, who had sustained serious injuries in a clash at Bhadaur town yesterday, was conducted at the Barnala civil hospital today. He had succumbed to his injuries last night. 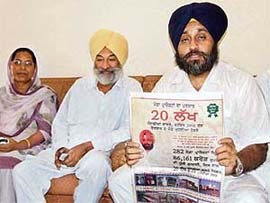 SAD MP Sukhbir Singh Badal today accused the Congress regime of resorting to "utter lies" and spending huge amount of public money on its ad campaign in print media. He stated that his party would raise the matter before the Election Commission. SAD secretary-general Sukhdev Singh Dhindsa said here today political posts in the Congress, including party ticket and the posts of Chief Minister and ministers, were being sold. To get rid of his wife and children, a Havildar of the Army, in connivance with his mother, brothers and sisters, killed them. The police has arrested Surinder Singh Behal, Additional Sub-Divisional Engineer, Punjab State Electricity Board, his two sons and nephews under Sections 302, 148, 149, 323, 427 IPC following a mid-night shootout here. The family members of the founder of the BSP, Kanshi Ram, today demanded a CBI inquiry into death of the leader alleging that BSP supremo Mayawati was responsible for it. 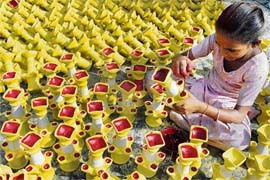 They also expressed their desire to embrace Budhism on October 14 in Lucknow. Gill Surjit, one of the most sought after directors for Punjabi folk dances — Bhangra, Gidha, Summi and Jhumar is himself a versatile artiste. For 15 years, he represented Punjab either as a folk dancer, a choreographer or as in charge of Punjabi culture troupes at Republic Day functions in Delhi. “The decision to form a poll alliance in the coming state Assembly elections with the communist parties and BSP is neither in his hand and nor in the hands of the Chief Minister. A delegation of BJP leaders led by the national secretary of the party, Mr Harjit Singh Grewal, here today met the Punjab Governor to seek compensation for the farmers whose cotton crop was damaged by a hailstorm in the Abohar-Fazilka belt last month. 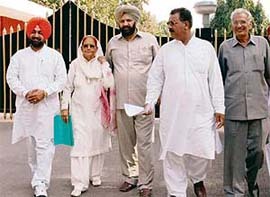 Mr Harjit Singh Grewal, secretary of the BJP, along with other leaders come out of Punjab Raj Bhavan after submitting a memorandum to the Governor on Thursday in Chandigarh. A shortage in the coal stock occurred in the 1260-MW Guru Gobind Singh Super Thermal Plant here today. The coal stock left in the plant is likely to last only four to five days. As per the Central Electricity Authorities, the plant should have a coal stock enough for at least 15 days, revealed thermal plant sources. Cabinet Minister Jagmohan Kang, accompanied by Deputy Commissioner Alok Shekhar, today launched a 15-day cleanliness drive from Marouli Kalna village that belongs to freedom fighter (associated with the Gaddar party) late Kanshi Ram. Neither yoga nor any exercise could correct the refractive error in eyes and rid people of their spectacles, stated Dr Amrit Sethi, president, Bathinda Opthalmological Society, while addressing a press conference, jointly held by the society and a pharmaceutical company to mark World Sight Day here. The Chief Judicial Magistrate (CJM), Mr Virinder Aggarwal, today framed charges against former district T B officer, Dr Mittarpal Devgan, and two others, Inder Lal, the then senior clerk in Government Medical College, and Mr Madan Lal, who retired as accountant, PHC, Lopoke, in a fraud case. The Punjab government has decided to re-appoint Mr Gurbachan Singh Babaehali, former district president of the Congress in Gurdaspur district, as chairman of Milkfed. Mr S.K. Goel, Additional Sessions Judge, here, today sentenced to life Karamjit Singh (23), and Avtar Singh (21), both residents of Chathe Gobindpura village (Sangrur), in a case of murder registered at Khanauri police station on December 3, 2004. Both were also ordered to pay Rs 5000 each as fine under Section 302 of IPC. Punjab Technical University (PTU) is thinking to close down the under performing distance education centres. A criterion is being developed to assess the performance of the distance education centres of the university in the region.